We at Villa Mar Colina are very excited to announce that we have a newly refurbished 2 bedroom/2 bathroom Town House available. The very roomy bedrooms and bathrooms are downstairs and the living area and large Balcony are upstairs, and of course the views are breathtaking. The apartment also has a secure remote controlled garage. Come and check it out we are sure you will not be disappointed. 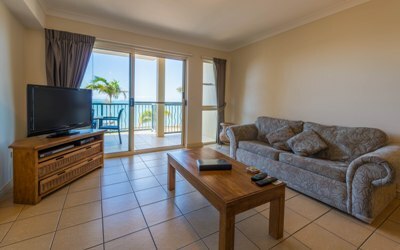 While you are here we would recommend you stay for a while and check out all the Capricorn Coast has to offer. The magnificant Yeppoon Lagoon, Keppel Island, Byfield National Park, War Memerial Emu Park, just the name a few of the wonderful attractions. Yeppoon, a destination, not just a stopover. Great things are happening in Yeppoon. Gone are the days and nights of nothing to do. Yeppoon now offers fun and entertainment for all our visitors. Yeppoon foreshore precinct has had a major overhaul and now offers not only beautiful gardens, a water park, skate park, playground but a magnificent Lagoon for not just families, but for everyone to enjoy. We have found at Villa Mar Colina that guests are extending there stay once they realise all the town now has to offer. Great shopping, great restaurants including Vue Wine bar and Restaurant, Afishionados, Charlies on the Beach, Megalomania and Pie Ally just to name a few. Of course, one could not leave without a day cruising the Keppels with Funtastic Cruises or visiting Keppel Island with Freedom Fast Cats. Another great day is a trip to Byfield National Park to discover all the great walks. Whatever you enjoy doing would certainly take longer than an overnight stay in Yeppoon. Come and check us out. 1. Stunning Views – Imagine sitting back on your private patio taking in the spectacular views of Keppel Bay. 2. Very Roomy Apartments – Our apartments are extremely roomy with separate dining, living area and large bedrooms. 3. Own Private Patio and remote controlled lock up garage – Sit back, relax, enjoy, knowing your car or motor bike is securely locked away. 4. Quiet Location – Villa Mar Colina is situated in a very quiet location, but still only 150 meters from Yeppoon’s town centre, beach, restaurants and shops. 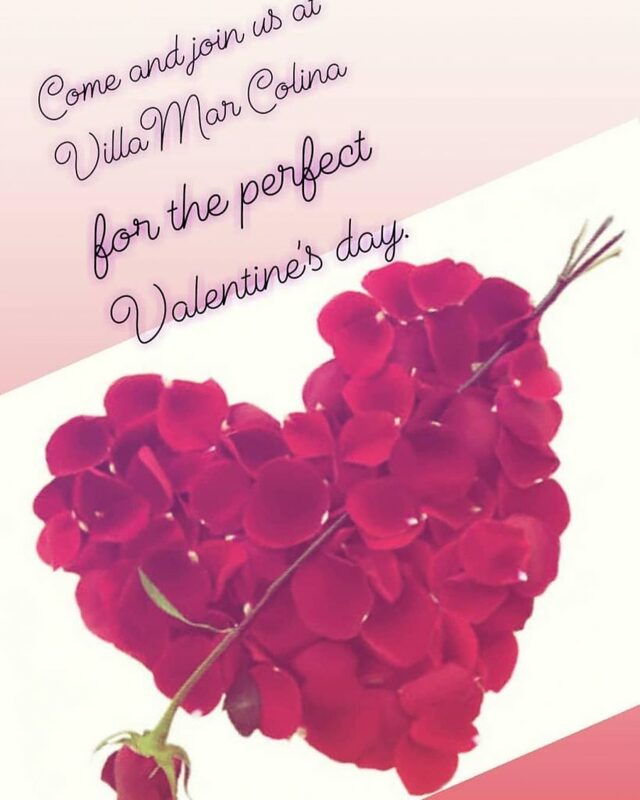 Stay at Villa Mar Colina this Valentines Day and receive complimentary wine and chocolates on arrival. There are also Plenty of great restaurants in Yeppoon offering special Valentine’s Day menus. Dinner and show at Footlights Theatre Restaurant Ph 0749392399, 6 course dinner at Charlie’s Cafe Phone 0439 988 903 Vue wine bar and restaurant Ph4939 8034. MegalomaniaRestaurant Ph 49392333. So exciting to be able to offer our guests great accommodation in Yeppoon and so many dinner choices for that very special person in your life. Are you dreaming of escaping winter and heading to a tropical hideaway? Is the air still crisp with the sting of winter and you’re finding it hard to roll out of bed in the morning? If you’re from the southern states and you’re looking for an out, we promise it doesn’t have to be all woolly jumpers and socks this winter. Follow the sun to the Capricorn Coast! There’s nothing like drizzle to make you dream of sunshine. Or nippy winds to turn your thoughts to tropical idylls. Those from the southern parts of Australia dream of escaping the icy reach of old Jack Frost at this time of year. The Capricorn Coast, Yeppoon and Villa Mar Colina offer an escape from winter dreariness and provides a place where summer is eternal and shorts are a year round staple. Yeppoon does experience cooler nights in the winter months but in comparison to the southern states, it’s quite simply lovely weather. The daytime winter temperatures on the Capricorn Coast are ideal for relaxing pool side with a good book and a cocktail, and the endless blue sky will have you forgetting grey old winter in no time. To escape the winter chill, why not join us at Villa Mar Colina for that mid winter getaway to relax and recharge and forget about the cold? There was no shortage of something blue at Natalie and Scott’s wedding, when they recently celebrated their marriage in Yeppoon. With the azure ocean as a backdrop, this couple were in their element along the sandy shores of Lammermoor Beach to say their I Do’s. Natalie got preparations underway in the stunning Penthouse at Villa Mar Colina. With views along the Capricorn Coast, there was no shortage of perfect photo opportunities. Under beautiful blue skies, Natalie and her four bridesmaids enjoyed their time in front of the camera with perfect weather and the islands as their inspiration. Why not start your happily ever after in the Penthouse at Villa Mar Colina? With outstanding views, three bedrooms, private spa, entertainer’s kitchen and huge lounge, this wonderful penthouse apartment will accommodate your bridal party in total luxury. Following is just a small selection of photos from around Villa Mar Colina.